It's 1940 and Roy Earle, the last surviving member of the Dillinger gang, just got out of prison by way of an unexpected pardon. Big Mac M'Gann laid down big bucks to get Earle out, because Big Mac's a got a job in the offing that's going to require a big-timer with guts. But it's not quite like the old days. Prison has taken its toll on Earle's nerves, and he has to work with two small-time punks and the streetwise girl they brought along for kicks. Worse, along the way Earle meets a poor migrant family, and finds himself falling for a destitute farm girl born with a clubfoot. But nobody is tougher or more professional than Roy Earle, and he deals with each situation with his own brand of grim resolve, whether it's letting a woman know how things are, or machine-gunning a night watchman who won't stay still. Inspired to write early on, W. R. Burnett had no success until, at age 28, he moved from Springfield, Ohio to Chicago and took a job as a night clerk in a seedy hotel. This job brought him face to face numerous underworld characters, and gave Burnett the material he needed for his breakthrough novel, Little Caesar. 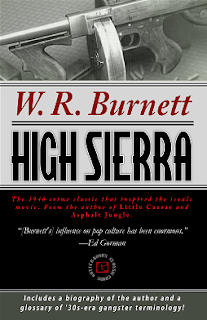 Always a prolific writer, after Little Caesar Burnett produced other landmark works of crime fiction that became classic films, such as High Sierra, and the dark noir masterpice, Asphalt Jungle. Don't miss this classic! The criminals are three dimensional and their hardboiled '30s-era dialogue comes off the page. By the author of Little Caesar and Asphalt Jungle! The inspiration for the movie that launched Humphey Bogart's career! Includes a biographical essay and a glossary of the underworld terminology used in the book!